Susanne Prindall, Hohenfels Education Center ESS. Photo by Lorain Ambrocio. 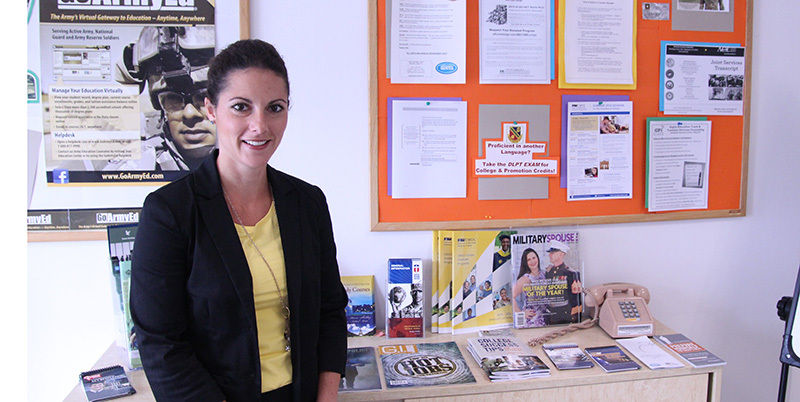 HOHENFELS, Germany — Two new education services specialists have landed in Bavaria with one goal in mind: help service members excel in their education through community outreach. In Grafenwoehr, Erin Sorensen sits in her new office well before opening hours, coming up with needs assessment surveys and outreach techniques for the community. As 7:30 a.m. nears, she begins to greet new and old service members, counseling them from how to begin school to benefits that begin after serving in the Army. Since starting as the new ESS, Sorensen has bolstered the Tower Barracks Education Center into a fully functioning center with a readily available computer lab for service and family members, counseling services and school representatives. 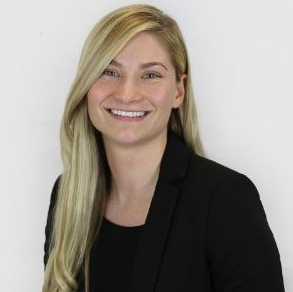 Sorensen has big visions to make the education center and its resources more accessible for the community, as some of her goals include enhancing how individuals receive services, expanding hours and having more readily available information. “Generally have a larger presence by conducting outreach to leaders in the community, such as command teams and family readiness groups,” Sorensen said. Prior to working with the Army Continuing Education System, Sorensen was a school counselor working with students from grades K-12. She later went on to work as a career counselor with the Transition Assistance Program, where she helped service members and dependents identify career goals and resources as they prepared to re-enter society as civilians. Sorensen earned her master’s degree in education and human resource studies from Colorado State University. Sorensen has spent the last year working as a career counselor in Bavaria for transitioning service members and families before becoming the ESS for Grafenwoehr. An hour south from Tower Barracks, Susanne Prindall quickly changes out of her flats for work heels, grabs her calendar and notebook, and races out the door to arrive early for her meeting. She does this another three times throughout her day before settling in to her quaint office for the remainder of the day, planning and creating marketing and education outreach strategies for the Hohenfels community. Like Sorensen, Prindall’s plans for the Hohenfels Education Center are to utilize community outreach in order to reach as many service members as possible by letting them know what the center has to offer. This can pave the way to those service members to raise their GT scores, attend Army schools, prepare them for college, and help them become an overall well-rounded and educated Soldier. “I want to be an integral part of the community,” Prindall said. Prindall grew up in Augsburg, Germany and met her husband in Hohenfels in 2005. After finishing her bachelor’s degree in secondary education at the University of Bamberg, Susanne and her husband got stationed in Fort Riley, Kansas. While in Kansas, Prindall received her master’s of science degree in adult education and conflict resolution, and then went through a series of PCS moves to San Antonio, Texas; Fort Riley, Kansas; Fort Carson, Colorado and finally back to Hohenfels. Prindall had plans of completing her doctoral degree at the University of Regensburg, but put them on hold in order to take the position of ESS at the education center. “There’s a possibility of going back, or even go to Boston for the PhD program there, but time and commitment are a factor,” she said. However, Prindall enjoys her position as the ESS and working with service members to better their education. By using more community outreach, Prindall hopes to change how Service Members think about education, and use the resources at the education center more.